Once Upon A Time….You know, I’ll be honest here. If you have never used an armorer’s tool to work on an AR variant rifle, I almost hate to endorse the Magpul Armorer’s Wrench as your first tool because you will never know just how bad most other armorer’s tools really are. You won’t know what it’s like to bruise your palm with over-pressure on a thin slice of metal handle. Or swear as your knuckles are bloodied when your castle nut wrench slips. Or scratch the finish off your new AR part. Or when you strip the hell out of whatever you are working on because your wrench just barely grips the nut before failing in world-class form. Instead I’ll just say there is no reason to go through hell just because I did. My house is not built with trees I chopped down myself. Nor did I ever suffer from Cholera before my water was chlorinated. Or lose a child or two in farming accidents long before CPS laws and the Humane Society. 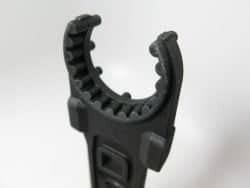 Maybe these examples are a little extreme, but like any great tool, the Magpul Armorer’s Wrench makes the job easier, safer, faster, and certainly more fun. When NASA builds a spacecraft it must compromise on the number of instruments and their placement on the craft. Not everything can be everywhere, and some instruments can get in the way of other instruments. The same is true with Armorer’s wrenches. It might be a stretch to compare a billion-dollar interplanetary spacecraft to a gun tool, but when creating from scratch anything new that has many functions, you need to work with both the individual components, and the relationship between the components. That’s one reason there are so darn many Leatherman tool models. If the leverage handle for one fastening tool happens to land on the sharp end of another tool, then using the implement just got worse. The Magpul Armorer’s Wrench has seven tools spread out over 11 inches. Maximum leverage is applied when the hand is furthest from the rotational point of the tool, but that also means your hand will be applying maximum force to the tool at that point. Lesser Armorer’s tools I’ve used literally hurt when force was applied because a pointed protuberance occupies what should be a ergonomic grip. I had to either wrap the tool with a rag or wear gloves in order to avoid injury or blood blister. Where’s the fun in that? Magpul provides not only a rock-solid palm platform for applying muscle-level force to the wrench, but also made the wrench the proper length to bridge the limitations of human anatomy with the foot-pound necessary for a proper rifle build. Even more, the wrench is designed for the extremes of using a torque wrench or breaker bar. Most of the other “Swiss Army do-it-all” armorer’s wrenches put another tool interface right where you need to apply force with your hand. Or they will offer a sliver of metal handle upon which you will apply massive palm pressure especially when trying to remove an excessively tight part. I have this neighbor who keeps every tool whether it’s any good or not. A while ago I helped him with project. While up on his roof and elbow deep in a skylight project, I asked for a number two phillips screwdriver. Instead of getting a #2, I got a handful of various screwdrivers of which only one of the seven actually had a useful blade. And it was only useful because it was the best of the worst. When I tossed six screwdrivers off the room, it seemed I hurt my friend’s feelings. But I quickly offered him a deal: Throw away all the junk screwdrivers and I’ll buy one good driver for him. A Snap On to be exact. I could tell by his big eyes when I said Snap On that we had a deal. My point here is that way too often we settle for less and then assume that a pile of less is actually more when it really is nothing more than a big pile of stinky less that’s only as good as the least worst one. Over the years I have gotten rid of every single lesser tool I ever owned. I ditched all cheap tools, metal tools made in China or Taiwan or forged in nowhere particular out of who-knows-what , and instead focused my tool acquisition only the highest of quality tools. Yes, the Snap On dealer knows me by name. A great warranty is great, but if bugging in because of civil unrest or EMP attack, you only got what you got. All warranties are null and void because society also currently null and void. But you don’t need to drop obscene amounts of money for the best tools in the solar system. You just need to buy the highest quality that meet your anticipated needs. I say “anticipated” because there are limits to what you can afford and even need. But the error many folks new to the AR platform make is that they fail to think beyond the immediate need. I’ll agree that it’s a rude awakening that you have to buy a specialized tool to install a new part on your AR, especially when the tool costs as much or more than your new part. So now the cost of a tool plus the price of the part…well now we are starting to talk real money. So why would you pay twice or three times as much as you need to? That would be because “need” is relative. If you are going to do something only once, then save money and a cheap wrench and some band-aids. But if you want a tool that will not break, will not fail, will not ever let you down, then there is only one AR armorer’s tool and that is the Magpul. Try this, ask around to see how many AR armorer’s tools your friends have, and if they upgraded along the way. And if so, how many times? I am so glad the DPMS armorer’s tool is no longer made. I have a DPMS tool and it looks like a winner, feels like a winner, but in use it’s really a whiner. It’s heavy. It’s thick. It feels like a strong tool that could take on the world. Sadly, that is just an illusion. In practice, the tool is hollow in performance, limited in strength, and wholly lacking in the way the tool grips the workpiece. But while the DPMS is now discontinued, there are plenty more whiners where the DPMS came from. Other armorer’s tools have limits with grab, rotation and grip. The online pictures of the DPMS armorer’s wrench make it look like a keeper, but when gunsmithing with the thing, the tool fails because the Amazon page does not show someone applying pressure to the wrench only to have it spin sideways, skip out of the hold, and flail around the workpiece scratching the heck out of the aluminum parts. To avoid slipping off the workpiece, or stripping the minimal hold points on the nuts, you need a tool that has been perfected for the task. OK, I admit I’m a fan of Magpul. I think they search for solutions like drones search for ISIS. At the bleeding edge of technology to and function, Magpul leaves everything on the field. It’s designs are as good as can be done right now. 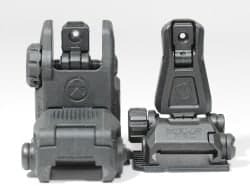 Upgrades follow only when we have learned from the previously generation of tool, whether buttstock, backup “iron” sight, or box magazine. When Gen2 comes out, they (and we) have learned. So consider the Magpul Armorer’s Wrench a Gen2. Magpul has learned from all the successes and failures of every previous generation of multi-function armorer’s tool that has ever been made. The restless folks at Magpul noticed that the AR armorer’s tool was broken. It worked, but was still in need of serious help. So Magpul to the rescue. The Magpul Armorer’s Wrench, aka the Magpul 535, weighs a tenth over a pound, and is 11.7 inches long. It’s made of heat-treated all-American steel, then covered head-to-toe in a manganese phosphate coating that gives it exceptional corrosion resistance and a refined feel that provides additional grip and a low reflectance that will keep the bad guys from catching the sun reflecting off your wrench when you decide to add a new sling plate on your buffer tube while on the battlefield. 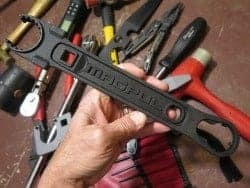 Using only US-made forged steel, Magpul created an AR armorer’s wrench that serves the basic needs of the AR operator and professional armorer alike with exceptional form, function, and most of all efficient interface with the human hand operating the wrench. As far as I can tell, Magpul designed this wrench by being honest about what an AR armorer’s wrench is used for. The list of AR jobs is longer than that the skill set of this wrench, but that’s the point. Other wrenches tried to do it all, but ended up doing it all poorly. Since 95% of the need for an armorer’s wrench is found in just two or three tasks, 95% of the design of the Magpul supports these tasks. The three most common needs for a dedicated armorer’s wrench are to remove/install a muzzle device, remove/tighten a buffer tube castle nut, and loosen/tighten a barrel nut or free float handguard ring. The icing on the phosphate coating cake of this wrench include two hammer faces, a rifle-length tube wrench, and a bottle-cap that Magpul guarantees will open both SAE and Metric bottle caps. There are many advantages of this Magpul wrench over other wrenches but most of them fit into three categories. 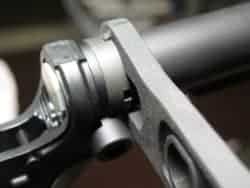 First, the Magpul Armorer’s Wrench grips it’s workpiece with more contact points than all other wrenches put together. 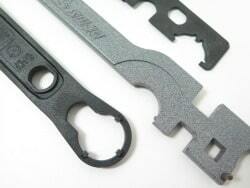 Second, the Magpul Armorer’s Wrench has a deeper and more secure interface with the workpiece. And finally and possibly most important is that the wrench fits well into the human hand when applying maximum pressure. Other wrenches manage to put a tool interface just where your hand needs to go causing either pain or need for gloves when twisting the wrench, especially when removing stubborn nuts. Now add to this the lack of workpiece grip of substandard wrenches and you have a perfect storm of disasters just waiting for the right moment to ruin your rifle, break the wrench, and rip the skin off your knuckles. So let’s take a closer look at the wrench. The castle nut wrench has two sides, each with a significant benefit. 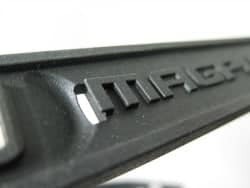 The Magpul logo’d side will completely engulf a USGI castle nut ensuring that a positive grip that cannot go flying off the handle, so to speak. But it only works on traditional castle nuts with no additional mounting plate features like QD attachment points, or Magpul’s own ASAP sling mount. So for enhanced plates, the reverse side of the Magpul Armorer’s Wrench grabs the castle nut from a distance with three beefy prongs. And that alone can be worth the price of this wrench. In both cases, this wrench requires it to be slid over the carbine buffer tube so the buttstock has to be removed, and there is risk of scratching the tube’s exterior if you slide it aggressively. The other end of the wrench holds a two-sided handguard interface, one side for traditional USGI barrel nuts, and one for common free-float tube nuts. The barrel nut wrench has two more contact palls compared to the DPMS taking the grip even further beyond the halfway point of grip. Since a barrel nut can be the highest torque interface on the AR platform reaching upwards of 80 foot/pounds, loosening a stuck barrel nut requires significantly more force than than the 80 it was born with. The free-float component of this wrench contains a seven-pin spanner that will safely and firmly provide torque to those expensive and lightweight floating handguard mounting solutions. And that too could alone justify the cost of this Magpul tool. The standard muzzle device uses parallel control surfaces exactly 3/4ths of an inch apart. 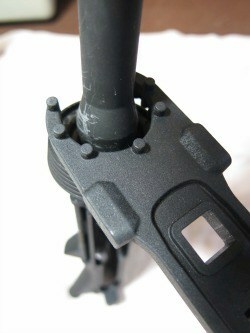 The Magpul Armorer’s Wrench embeds the muzzle device tool within the castle nut tool. In fact the muzzle device spacer is the same one used to accommodate the six-position adjustable stock rail running under the buffer tube housing. The single pear-shaped opening the southern end of this wrench is actually three different tools. Go ahead, admit it. We all use wrenches as hammers sometimes. So why not just build a hammer or two into the wrench? Done. The dual hammer faces provide ultra-convenient small but reinforced flat surfaces that are most effective for tapping punches and giving that little bit of umpf when necessary. But when in the shop a dedicated hammer is a wise choice. But the real impact of the hammers are to provide additional surface area to distribute the force on your palm when anger takes over your build. 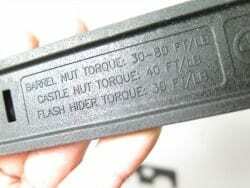 The half-inch square hole in the barrel nut side of the wrench accommodates a torque wrench and Magpul thoughtfully provided the common torque specs forged into the wrench. Magpul recommends using the torque wrench at a 90 degrees perpendicular to the wrench for best results. 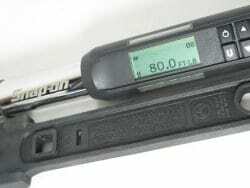 And if torque values are important to you, it is imperative to have a quality torque wrench. The inexpensive ones are known for being way off, often 10 foot-pounds or more. Another torque wrench issue is that many half-inch wrenches begin their range not too far from the fastener values used on guns. I prefer a digital torque wrench with a ⅜” ratchet since the wrenches with a smaller socket connector start at a lower value. Of course you loose some high end, but I do more lower-level torquing than high value twists these days. The ovalized hole opposite the torque hole is used to tighten/loosen rifle-length buttstock tubes. One last feature of the Magpul Armorer’s Wrench is that it truly is a thing of beauty…in a Glock sort of way. You won’t mind leaving the wrench out on the bench just to enjoy it sitting there. Or hang it on the wall in a prominent place in your shop. With all the eye candy we hang off our ARs these days, you might as well find pleasure with your tools. Yea, I know how that sounded, but you know what I meant.